Bangladeshi nationalism is an ideology propagated by former Bangladesh President Ziaur Rahman. 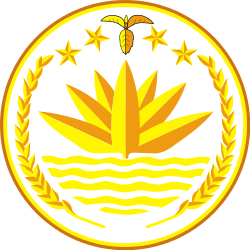 The ideology emerged during the late 1970s and is the institutional basis of Bangladesh Nationalist Party, one of the leading political parties of Bangladesh. The history of nationalism in the country dates back to the colonial era, when the region started witnessing anti-colonial movements against the British Empire. Soon, a sense of religious nationalism began to emerge which was later revolutionised into ethnolinguistic nationalism. Following independence of Bangladesh in 1971, leaders like Ziaur Rahman began to promote Bangladeshi nationalism which was based on territorial attachment of Bangladeshis. The idea of nationalism first emerged in the country especially after the Indian Rebellion of 1857 in the mid 19th century. The base of the nationalism was the anti-colonial sentiment during the British rule. This nationalism transformed into a new version through the partition of Bengal in 1905, which was strongly opposed by the Hindus in West Bengal and was supported by some Muslims of East Bengal. Even though the partition was annulled in 1911, it left a significant and lasting impact on the people, and for the first time sowed the seeds of Hindu-Muslim communal dissonance. It was the beginning of a religious nationalism which eventually led the Muslims to form a separate state. After the formation of Pakistan, within a short period the idea of religious nationalism began to be replaced by a sense of ethnolinguistic nationalism among the people of then East Pakistan which was primarily caused by the cultural, economic and political discrimination by the West Pakistani elites. The language movement of 1952 was the biggest manifestation of this ethnolinguistic nationalism which later came to be known as Bengali nationalism. This resulted in the demand for regional autonomy for East Pakistan that eventually led to the independence of Bangladesh from Pakistan. After independence, the government of Sheikh Mujibur Rahman began to promote Bengali nationalism which was also the basis of Bangladesh's independence from Pakistan. However, the nationalism based on the Bengali ethnicity left the indigenous peoples of Bangladesh dejected. Sheikh Mujib, rejecting the demands of constitutional recognition for the tribal culture and identity, urged upon the indigenous peoples to become Bengalis. Dissatisfied with the acts of the government, the indigenous peoples from Chittagong Hill Tracts formed Parbatya Chattagram Jana Sanghati Samiti, a political party, to demand autonomy. Bangladeshi nationalism means, we are Bangladeshis. We have a different history. Our country has been through a different process. Our traditions and culture are different. Our language is different, we are moulding it in our own way—we are modernizing it. We have different prose and poetry; we have different arts and thoughts. Our geographical position is different, our rivers and soils are different. Our people are different. We are completely free and sovereign… And today, a consciousness has grown among our people, which is different from that of the people of our neighboring country and other countries of the region. From this time, citizens of Bangladesh came to be known as Bangladeshis instead of Bengali. According to scholars, Zia's main aim to foster this new thought was to distant the country from neighbouring India which had developed extensive ties with the Sheikh Mujib government. Proponents of Bangladeshi nationalism argue that this ideology has an edge over the previous Bengali nationalism because of its territorial appeal which succeeds to include the indigenous peoples of Bangladesh as well as distinguishes the people of Bangladesh from the Bengali people of India. According to Muhammad Ghulam Kabir, "Zia was motivated by the desire to unify the country and to further assert Bangladesh's sovereignty." While replacing Bengali nationalism with Bangladeshi nationalism as one of the fundamental principles, Ziaur Rahman also removed the principle of secularism, which was also one of the main features of Bengali nationalism and inserted the line "absolute trust and faith on Almighty Allah". Scholars argue that it was a political strategy of Ziaur Rahman to win the confidence and support of the right wing political parties of Bangladesh. Zia also intended to strengthen the relations of the country with other Muslim states, especially from the Middle East. The act also helped the country to be differentiated from neighbouring India, a Hindu majority state. After the assassination of Ziaur Rahman in 1981, Hussain Mohammed Ershad, who held the power following a coup in 1981, also actively nurtured Bangladeshi nationalism with high priority on Islam. Ershad had to rely on the support of the right wing political parties as he did not have any support base within both the Awami League and Bangladesh Nationalist Party. In 1988, Ershad went even further by declaring Islam as the state religion. ↑ van Schendel & Guhathakurta 2013, p. 332. 1 2 3 4 5 Uddin 2006, p. 138. ↑ Wright 1988, pp. 31, 32. ↑ Alam 1991, p. 469. ↑ Mohsin 2003, p. 21. ↑ Mohsin 2003, p. 22. ↑ Mohsin 2003, pp. 23. ↑ Huq 1984, p. 58. ↑ van Schendel & Guhathakurta 2013, pp. 332, 333. ↑ Phadnis & Ganguli 2001, p. 39. ↑ Phadnis & Ganguli 2001, p. 107. ↑ Uddin 2006, pp. 138, 139. Wright, Denis (1988). Bangladesh: origins and Indian Ocean relations. Sterling Publishers. p. 310.
van Schendel, Willem; Guhathakurta, Meghna (2013). The Bangladesh Reader: History, Culture, Politics. Duke University Press. p. 550. ISBN 9780822353188. Huq, Abdul F. (1984). "The problem of national identity in Bangladesh". Journal of Social Studies. 24: 47–73. Uddin, Sufia M. (2006). Constructing Bangladesh: Religion, Ethnicity, and Language in an Islamic Nation. University of North Carolina Press. p. 224. ISBN 9780807830215. Mohsin, Amena (2003). The Chittagong Hill Tracts, Bangladesh: On the Difficult Road to Peace. Lynne Rienner Publishers. p. 166. ISBN 9781588261380. Alam, S.M. Shamsul (1991). "Language as political articulation: East Bengal in 1952". Journal of Contemporary Asia. 24 (4): 469–487. Phadnis, Urmila; Ganguli, Rajat (2001). Ethnicity and nation-building in South Asia. Sage Publications. p. 467. ISBN 9780761994381.